Greenpeace is claiming a Guinness World Record in the 'most Facebook comments in a 24-hour period' with its "Unfriend Coal" campaign directed at the company, an effort that aims to get Facebook Inc. to "drop coal and commit to 100 percent renewable energy, cutting its carbon footprint and helping in the struggle to prevent catastrophic climate change." Wait, is this really a real thing? After this week's GE tax hoax, one can't be too careful. A search of the Guinness World Records site doesn't turn up anything in that category, though it does reveal record holders in "Most Likes on a Facebook Post" (Lil Wayne) and "Most Fans on Facebook" (Zynga's version of Texas Hold'em Poker), so what Greenpeace has gone after is well within the range of possibilities. Greenpeace puts its record-breaking effort at 80,000 comments over the course of a full day. Do we file this under useful online action? 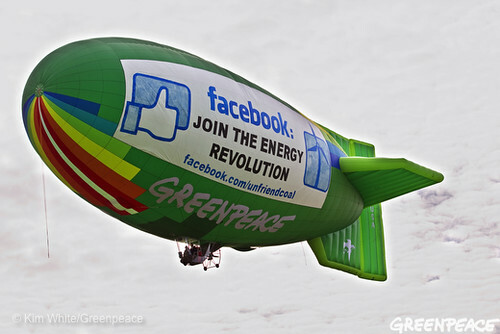 Well, the quest to break the Facebook record been getting the multi-year Greenpeace campaign much press this week. So there's that. And as for Facebook, a company statement seems to suggest they don't mind the organization's attention: "We continue to find this kind of engagement valuable and look forward (to) working with Greenpeace and others to address key environmental issues, including energy efficiency and renewable energy." Last week, Facebook anounced that it was launching something called the Open Compute Project, an initiative to "build one of the most efficient computing infrastructures at the lowest possible cost."